The ruins of an ancient Martian civilization have unlocked the secrets to teleportation, and the UAC will stop at nothing to harness this world-altering technology. As part of a Marine detachment sent to protect the facility, your duty seemed simple enough — until the invasion. Now, in an epic clash against pure evil you must fight to understand who is with you, who is against you and what must be done to stop this nightmare from reaching Earth. 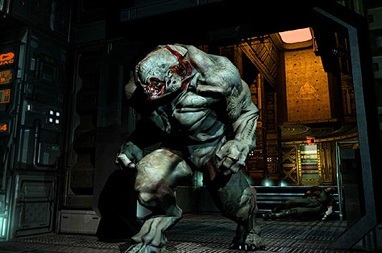 Built on ID’s revolutionary new 3D graphics engine, DOOM 3 draws you into the most frightening and gripping 3D gaming experience ever created. - Last Man Standing: Mod that incorporates many aspects of the Doom series. Copyright � 2005 Apple Computer, Inc. All rights reserved.